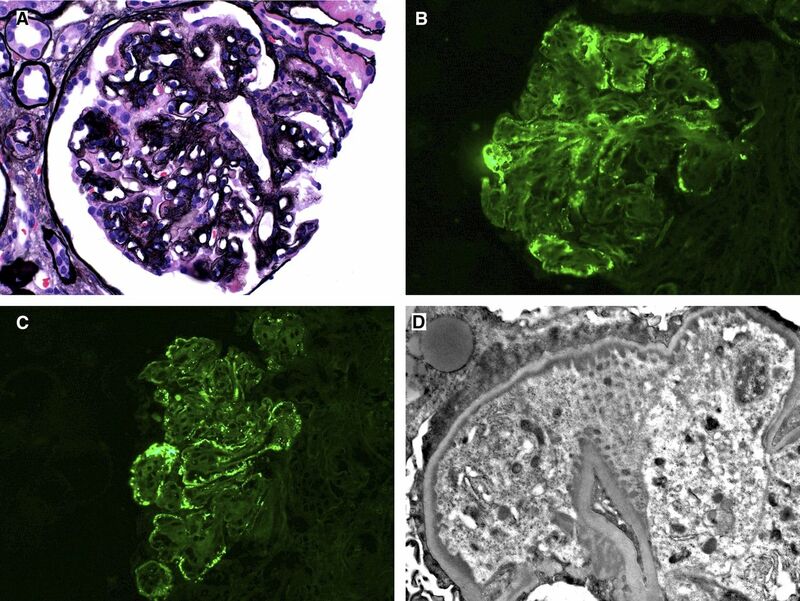 A 53-year-old white man with a past medical history of gout and uric acid nephrolithiasis was referred for evaluation of proteinuria and CKD. His serum creatinine (SCr) had been 1.5–1.8 mg/dl for at least 3 years, and his urine dipsticks were positive for blood and protein, which had been attributed to nephrolithiasis. He was then referred to nephrology for evaluation of his CKD. A urinalysis showed 3+ protein, moderate blood, and a urine microscopy revealed many dysmorphic red blood cells per high powered field, without red blood cell casts. His urine protein-to-creatinine ratio was 3000 mg/g and his serum albumin was 4.1 g/dl. A serologic workup was performed and included serum protein electrophoresis, which showed a small (0.1 g/dl) monoclonal spike in the γ region that was identified on serum immunofixation as IgGκ. His serum free light chains showed a free κ of 17.5 mg/L (normal range, 3.3–19.4 mg/L), λ of 11.6 mg/L (normal range, 5.7–26.3 mg/L), and κ/λ free light chain ratio of 1.51 (normal range, 0.26–1.65). His hemoglobin was 13.3 g/dl and his serum calcium was 9.3 mg/dl. Refer to hematology for bone marrow biopsy. Perform positron emission tomography scan. There is no evidence that the patient has an overt hematologic malignancy—that is, aside from kidney insufficiency, he does not have any signs or symptoms of multiple myeloma (elevated calcium, anemia, or bone pain suggestive of lytic lesions) or systemic lymphoma (pathologic lymphadenopathy, hepatosplenomegaly, or constitutional symptoms, and normal complete blood count). Moreover, there is no evidence of extrakidney organ deposition disease by history, exam, or laboratory testing. Therefore, it is important to perform a kidney biopsy to diagnose the cause of his kidney insufficiency, and specifically to determine whether the patient’s kidney disease is related to the IgGκ monoclonal gammopathy. He underwent a kidney biopsy that showed proliferative GN with monoclonal IgG3κ deposits with moderate interstitial fibrosis (Figure 1). He was then referred to hematology for evaluation of an underlying clonal cell disorder. A bone marrow biopsy revealed 5%–10% plasma cells that were κ-restricted on immunohistochemical staining. A skeletal survey was negative for lytic lesions. Kidney biopsy showing proliferative glomerulonephritis with monoclonal immunoglobulin deposits. (A) Glomerulus with mesangial expansion and basement membrane duplication (Jones methenamine silver; original magnification, ×400). (B and C) IgG (B) and κ (C) were positive in glomeruli, whereas λ (data not shown) was negative (direct immunofluorescence). (D) Subendothelial electron dense deposits were present by electron microscopy (original magnification, ×12,000). Images courtesy of Dr. Chris Larsen, Arkana Laboratories, Little Rock, AK). What should be the next step in management? Periodic monitoring for monoclonal gammopathy of undetermined significance because he does not meet criteria for multiple myeloma. Treatment with a bortezomib-based regimen. Treatment with a mycophenolate mofetil-based regimen. Treatment with a rituximab-based regimen. Proliferative GN with monoclonal Ig deposits (PGNMID) is diagnosed on the basis of a kidney biopsy showing membranoproliferation, endocapillary proliferation, or mesangial glomerular proliferation on light microscopy; monotypic Ig (most commonly IgG3κ) and complement deposition on immunofluorescence microscopy; and nonorganized, immune-type glomerular deposits on electron microscopy (1,2). It is a monoclonal gammopathy of renal significance (MGRS): a monoclonal Ig (paraprotein)-mediated kidney disease that occurs in patients who do not have multiple myeloma or systemic lymphoma (3). The MGRS disorders occur because of clonal B or plasma cell clones that produce the pathogenic paraprotein. For reasons that are not understood, and in contrast to other MGRS, the majority of patients with PGNMID do not have a detectable circulating paraprotein or underlying clonal cell disorder (2,4–6). The median age at diagnosis for patients with PGNMID is 55 years, and about half of patients present with full nephrotic syndrome (2,4). Although the initial published data on PGNMID describes a poor renal prognosis with immunosuppression (2), recent MGRS literature has shown improved kidney outcomes when chemotherapy is used to target the underlying clonal disorder compared with nonspecific immunosuppression (6–8). Thus, the discovery of a small clonal plasma cell population (i.e., that does not meet criteria for multiple myeloma) in this patient is very important in choosing the optimal therapy. These regimens are extrapolated from those used in the treatment of multiple myeloma and systemic lymphoma. Bortezomib-based regimens are first-line in the treatment of plasma cell dyscrasias and would be recommended in this case. Relapsing disease after treatment and recurrence after kidney transplant have been observed (6,9). Treatment outcomes have not been validated in PGNMID, but recent data in other MGRS suggest that both hematologic (i.e., improvement/resolution of paraproteinemia) and kidney (i.e., improvement in proteinuria and stabilization/improvement in kidney function) responses are important (8). This case illustrates that a multidisciplinary approach with hematologists is necessary to properly diagnosis and treat MGRS (5). Given the rarity of these disorders, consultation with nephrologists and hematologists at centers with MGRS expertise may be required for optimization of a therapeutic plan. The patient was treated with intravenous cyclophosphamide (600 mg/wk), subcutaneous bortezomib (1.3 mg/m2), and oral dexamethasone (40 mg/wk), for 3 weeks on and 1 week off, for six cycles. At the end of treatment, his SCr remained stable at 1.7 mg/dl (the best was 1.47 mg/dl) and his proteinuria had decreased to 98 mg/g. His serum protein electrophoresis continued to show a detectable monoclonal spike that was below the lower limit of quantification and serum κ/λ free light chain ratio remained normal. He did not experience any treatment-associated side effects. Eighteen months after completing treatment, his urine protein-to-creatinine increased to 1.1 g/g. A repeat kidney biopsy again demonstrated PGNMID (IgG3κ). Because he had previously tolerated and responded to bortezomib-based therapy, he was treated with subcutaneous bortezomib (1.3 mg/m2) and oral dexamethasone (40 mg/wk), for 3 weeks on and 1 week off, for six cycles. Cyclophosphamide was not prescribed in order to minimize his cumulative exposure to alkylating agents. This second treatment was well tolerated. His SCr remained stable at 1.7 mg/dl and his proteinuria improved to 0.2 g on 24-hour collection. J.J.H. would like to thank Dr. Chris Larsen at Arkana Laboratories (Little Rock, AK) for providing pathology images and captions. For most American Society of Nephrology (ASN) Kidney Week attendees, case-based clinical nephrology talks are one of the most exciting venues. The Nephrology Quiz and Questionnaire is the essence of clinical nephrology and represents what drew all of us into the field of nephrology. This year’s Nephrology Quiz and Questionnaire in “The Big Easy” (city of New Orleans), with full-house attendance, was no exception. The expert discussants prepared vignettes of puzzling cases, which illustrated some topical, challenging, or controversial aspect of the diagnosis or management of key clinical areas of nephrology. These eight interesting cases were presented and eloquently discussed by our four expert ASN faculty. Subsequently, each discussant prepared a manuscript summarizing his or her case discussions, which serves as the main text of this article (Mark A. Perazella and Michael Choi, Comoderators).